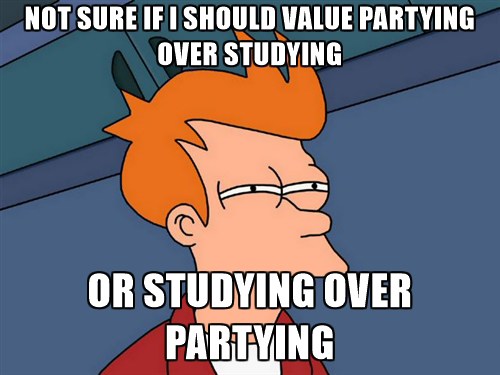 Studying or partying, which would you choose? Now my Erasmus is almost over I came to the point of comparing my studying (among other things) experience in The Netherlands and England. What do these neighboring countries have in common about the studying process and how they differ from each other in other aspects of student life. I’m doing a full bachelor in the University of Applied Sciences back in the Netherlands so most of the disciplines are focused on practice. Assignments, portfolio items and group projects, that’s how we get the cherished credits and the further feeling of accomplishment. Each quarter we start from a so-called kick-off session where our teachers try to explain what they expect to see from us at the end of the quarter. Let’s say they try, because usually it takes ages and infinite times of reading the cluster manual to have a clear idea what you should actually do. Peculiarities of being a student of the creative course. I was pretty used to being prepared to start working on the concept development from the very first study session. Or reading a cluster manual in advance and having a brainstorm session to come up with a brilliant idea and show yourself off in front of your classmates. Well let’s say it didn’t always work but we tried our best. We could have up to 10-12 subjects in 1 quarter which takes 10 weeks to finish. So there was no time to chill (just joking we still had fun in the first weeks but much less than in England). Coming to my first studying session in England was a pretty different experience. I chose the modules for my minor program which I thought would develop my skills in the field of advertising and marketing. I knew that all 3 modules I chose are from different years of the study program so I had basically 3 different groups of classmates throughout the exchange period. I liked a well organised plan of the lectures and seminars: you begin with the lecture session and right afterwards discuss the material you were given during a seminar. So all the questions which could appear during the lecture would be answered pretty fast not leaving yourself confused when you decide to start the assignment. It only helps when you attend the classes of course. Though I was nervous about being not scanned when I miss the class. Yes, that’s right, being scanned almost like in a supermarket, only the teacher will ask for your student card with a bar code on it. I’ve heard that if you miss 3 classes in a row, it’ll be reported and you’ll have a problem. In the Netherlands it was up to you to attend a class or not, the final result is your concern. I forgot that there is a full semester for all my assignments and projects so I followed the same pattern before going to my first class like if I’d be in my Dutch uni. Reading a manual and rushing up from the first session and trying to figure out what should I develop as final work for each module. Only after some time I chilled out when I noticed that my team mates in the group project are not really bothered about finishing their research after the first week. I checked the deadlines and lived happily ever after… Only when the reminder on my calendar was showing the inevitable coming of the deadline. After some time in The Netherlands you become a bit Dutch. Cycling everywhere in whatever state you are and whatever the weather is outside. Trying to find the cheapest supermarket nearby and sometimes going for luxury treats in a branded shop. Wearing casual clothes and shoes and not showing off too much when going out to a pub/club. Starting to be more sporty and buying a subscription to gym. That’s a few things from the Dutch lifestyle I adopted. I noticed that after coming to England the wave of mass brand consuming hit me hard. First thing I’d like to mention is that money you spent in pounds is already a bigger amount if you’re comparing to euro currency. So actually 1 pound shop just sounded good but in real life I spent more than 1 euro for 1 product. There are a few things I still don’t understand about English students. England is the country known for its regular rain showers and cold weather in general. How come that all the English students are used to going to the club without any outerwear and not catching pneumonia or simply not freezing to death? Stable immune system or resistance. Who knows? Another habit which was strange for me is calling a taxi for getting to a club when it’s not that far from the place you live. Absolutely the opposite to what I’d do in the Netherlands: put the warmest outerwear on and cycle as hard as I can to the club. Cultural differences? Maybe. Since I’m neither Dutch nor English I can’t judge and explain why. I used to live near Lidl and Aldi so going for groceries became slightly cheaper and helped to survive in the end of the month. In England I was faced with the problem of finding a low-budget supermarket nearby. Only Tesco and Sainsbury’s, which are located in the city centre, satisfied my needs. There was Aldi in my area but you had to take a bus or even worse – a taxi in order to be able to bring your heavy shopping bags back home. I didn’t want to pay for a short ride so walking to the city centre became my shopping routine. Cycling makes your life so much easier but I wanted to get back home alive. Though I quite liked the idea of having a corner shop or convenience store just a few metres away from your accommodation. They saved me from starvation when I felt like only going outside in my pyjamas or didn’t prepare any food for a hangover day. The variety of fast food and bakeries everywhere from frozen food stores to patisseries and 1 pound shop bakery. English just love food and especially with the highest amount of calories possible. Passing by the bakery section in a supermarket was torture in the beginning but the thought of gaining weight discouraged me every time. Being healthy in England was quite a challenge for me. My flat kitchen was soaked with the smell pizza or lasagne. I might be confused about some things in England and English people but I can say for sure that I’d like to get back to this country of temptations. Next story Live and Upcoming Show – Summer Update!